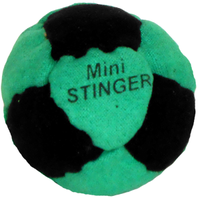 This steel pellet filled wonder is the smallest we make. 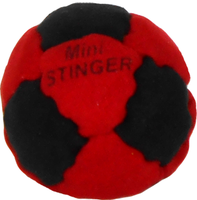 A true mini-footbag that packs a punch. 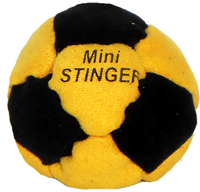 Smaller than our Mighty Mite in stature and weighing in at a whopping 50 grams, every footbagger will want this one in their arsenal. 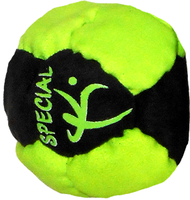 Pulling this footbag out when the circle is fading will ensure a bounce in energy levels from everyone in the circle. I love bags 1.2"-1.8" so this of course became a favorite bag of mine. 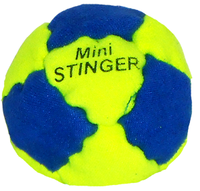 Super springy and controllable, but still stalls pretty easily from being 14ish panels, so it doesn't roll off your foot easily. I wish it was like 5 grams lighter, a touch less filler. Other than that, it's still 5 stars I knew it'd have some weight to it. The Mini Stinger is ferocious. 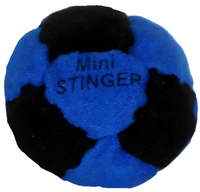 Such a tiny footbag to throw in a coat pocket, but man this thing packs a punch. It's got a solid solid feel to it, doesn't flop, but still stalls, and man does this thing pop. 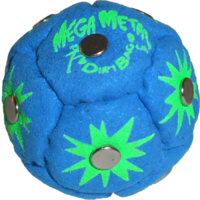 A real compact controllable springy all stainless steel pop. 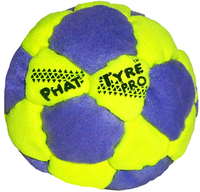 Great to kick around after something way bigger like the Phat Tyre Pro. 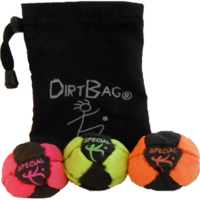 Big up to Jim and Flying Clipper for creating so many designs, fills, and weighted footbags. The best out there.